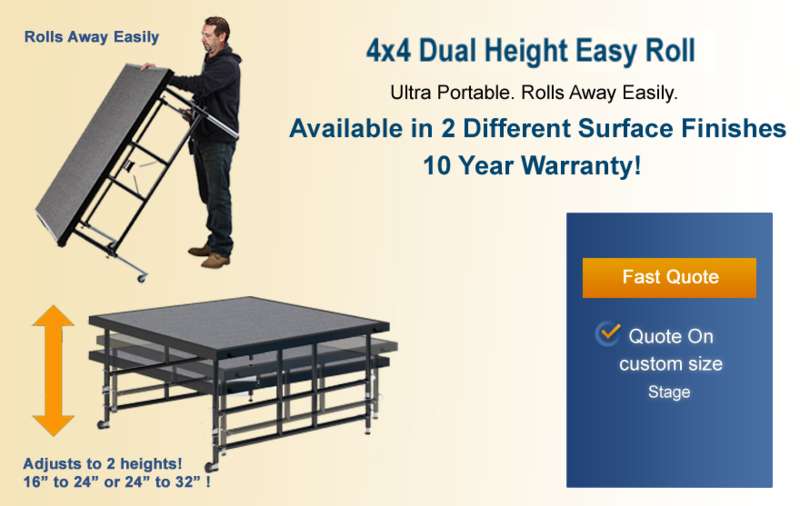 4x4 Dual Height Easy Roll stage panels are a great value and are available in 2 different surface finishes ( hardboard or in your choice of several carpet colors) and 2 different dual-height options (you can choose from stages that adjust from 16" to 24" in height or 24" to 32" in height). This economical modular staging is lightweight, modular and features folding lock-in-place telescoping legs that can be height adjusted to 2 different heights. Stages sections combine easily together using special platform to platform mechanisms so you can easily create the size you need. These stages come with a standard 10 year limited life warranty. *Please note 4x4 Dual Height Easy Roll staging only works with other 4x4 Dual Height Easy Roll staging or accessories . If you need assistance putting together a Dual Height stage system that fits your needs and budget please call our friendly staging experts at:877-884-3426 or email us at orders@thestagedepot.com for assistance.